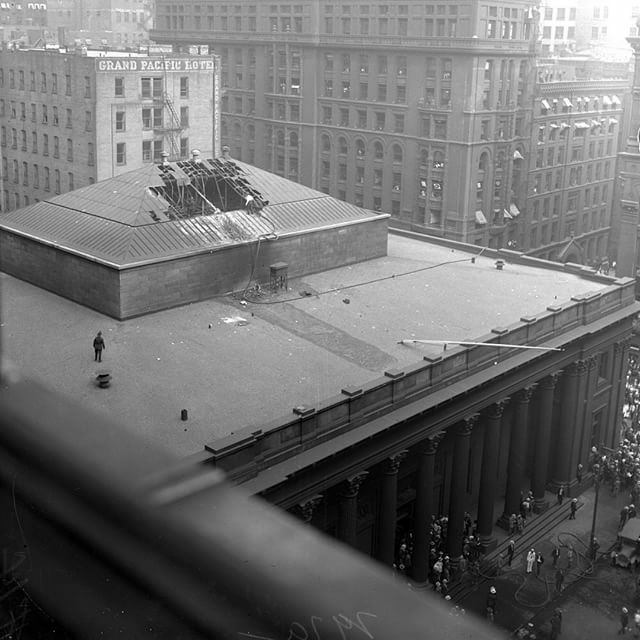 July 25, 1919 – In Room 1123 of the county building Coroner Peter M. Hoffman conducts an investigation into the cause of the fire that sent the dirigible Wingfoot Express into a fatal plummet through the skylight of the Illinois Trust and Savings Bank on La Salle Street, setting off a gasoline-fueled conflagration that kills a crew member, two passengers, and ten employees of the bank. Dramatic testimony comes in the person of the airship’s pilot, John A. Boettner, who testifies that there were no sparks or flames thrown from the engine and that the engines were running when the fire was spotted. “I discovered the flames near the front of the bag and up above the equator,” Boettner says, “I rose to my feet and holding the wheel with one hand turned and by motions and shouts told the others to jump. I saw them go over and then the bag buckled. As the gondola shot forward I took a long dive toward the ground.” [Chicago Daily Tribune, July 26, 1919] The above photo shows the skylight of the Illinois Trust and Savings Bank through which the dirigible fell to the banking floor.